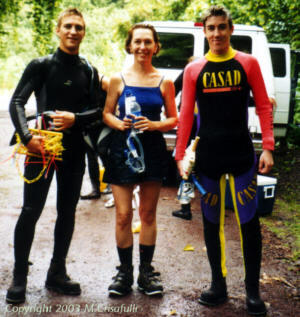 This stream, located off the road to Hana, was our first field location. We parked the van on a narrow access road and then carried our gear along a barely visible path into the stream. There was no actual bank since the vegetation simply continued down into the stream, so once we entered the stream we were in it until we finished. With frequent rain showers and our green surroundings we almost felt like we were in another world. Molly and Tim, field assistant, laid out a grid pattern and we did a complete survey of several randomly selected squares, counting every limpet. 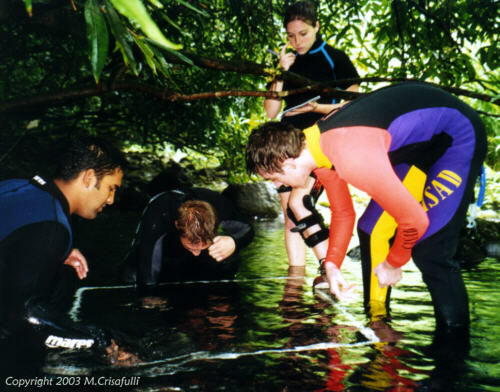 The statistical data collected by several teams of volunteers provides an accurate picture of aquatic life in the stream. The water was still, but surprisingly cold. Mollie uses the floating sample case as a desk as she records survey data. Although the section we were in flows to the ocean, the stream is completely diverted just a little ways upstream. 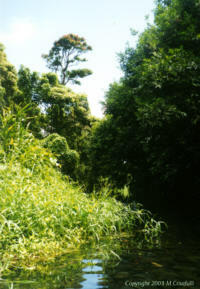 The survey area is actually a secondary stream and technically not really Honomanu. This page and its contents © Copyright 2003 Michael & Karen Crisafulli. All rights reserved.